The Grove at Shoal Creek is an approximately 76-acre Planned Unit Development (PUD) located just Southeast of the corner of Bull Creek Road and West 45th Street. The project will consist of a mix of residential housing types including affordable housing, a mixed-use district with retail and office, and over 20 acres of publicly accessible open space. The PUD Zoning for the project, approved by City Council on December 15, 2016, requires the dedication of almost 19 acres of public parks. The Public Parks Master Plan for The Grove at Shoal Creek will guide the development and maintenance of those public parks. The 1-page Parks Plan Exhibit describes the specific requirements for parks at The Grove at Shoal Creek. The final Grove at Shoal Creek PUD Ordinance No. 20161215-075 can be found here. Additional detail regarding plans for the overall development can be found on the developer's website. The Public Parks Master Plan for The Grove at Shoal Creek is being developed by the property owner in collaboration with the Parks and Recreation Department (PARD) with input from the community. 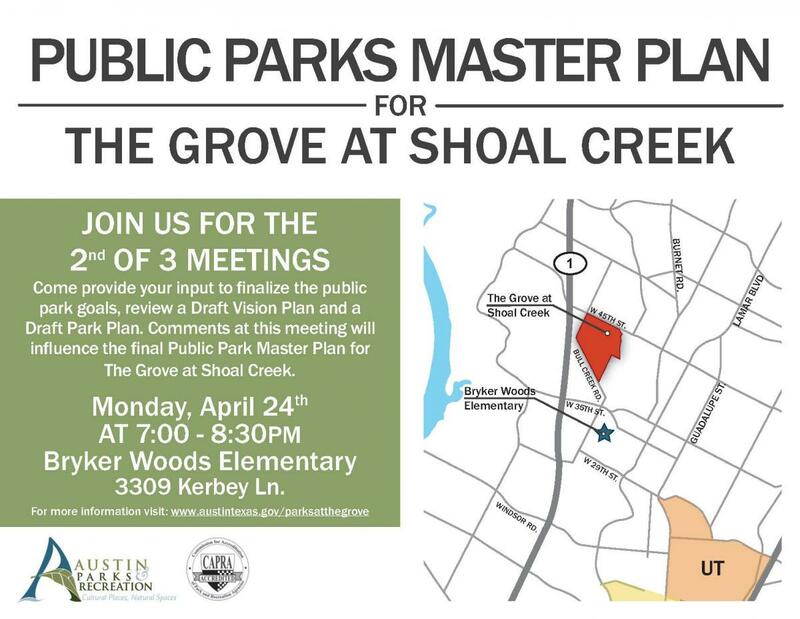 There will be three Public Input meetings held to solicit input from the community regarding goals and programming priorities for the public parks at The Grove at Shoal Creek, to discuss a vision plan and design alternatives for those parks, and to present the resulting Public Parks Master Plan. The Resulting Public Parks Master Plan will then be presented to the Parks Board in summer 2017 for recommendation and to the Director of PARD for final approval. The approved Master Plan will be the guiding document for both initial park improvements constructed by the developer of The Grove at Shoal Creek and future capital improvements to the parks. These meetings will be held at Bryker Woods Elementary, 3309 Kerbey Ln.